Each shirt sold feeds big cats! Big Cat Rescue provides the content for this zoo keeper training. All fees paid for your tuition and membership in this community helps save lions, tigers and other wild cats. This bill called the Big Cat Public Safety Act is the most important piece of legislation to ever be introduced to protect lions, tigers, and other exotic wild cats from being kept as pets and in miserable roadside zoos. 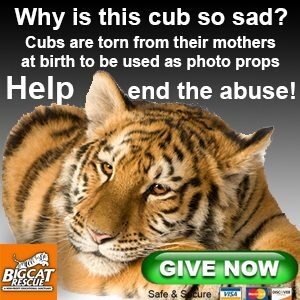 IF YOU ONLY DO ONE THING TO SAVE BIG CATS; THIS IS THE ACTION TO TAKE TODAY!! !